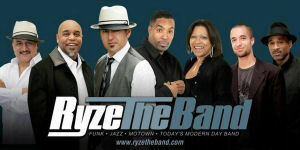 Ryze the Band was created on December 31st, 2007 to keep LIVE MUSIC alive. "RTB is stronger and funkier," says Lead Vocalist "CC" Carter, who affirms it's rooted in what we have always been...different. RTB is from the Bay Area and is comprised of talented, seasoned musicians with 30 years combined experience in touring, recording and live performances throughout the country. Drummer/Vocalist, Joey Jam Flores, admits "We have the best of the BEST in all sections. There is no substitute."